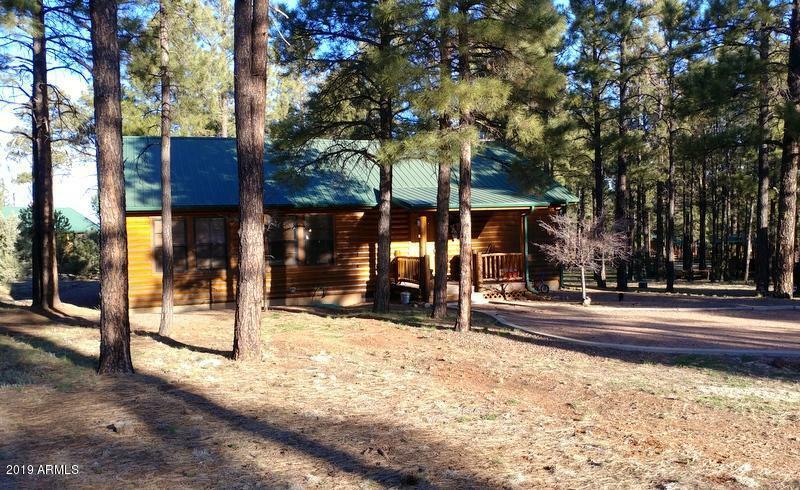 A beautiful .98 ace lot with tall ponderosa pines surround this cabin and 2 car garage located in Bison Ranch. You will be greeted with a feeling of warmth and delight as you walk into the 3 bedroom, 2 bath cabin with wood trim, tongue and groove vaulted ceiling plus floor to ceiling river rock fireplace. Large living room, new bronze fixtures in baths, granite counter tops in kitchen and new refrigerator. An expansive covered back deck to enjoy the beauty of the outdoors allow for relaxation and room for entertainment. Newly built 48' X 16' dog run. Take a look at this unique property in Bison Ranch.